We fished most of the week in less than7 ft. of water with SPRO Aruka Shad 5/8 oz. rattle bait being the best choice, we also fished several colors gold, Royal shad, and red being the best choices. 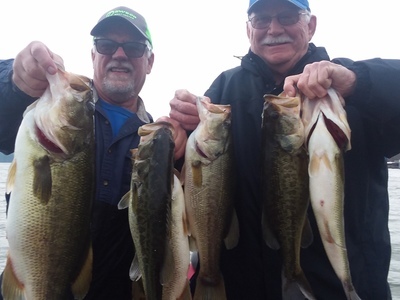 We also caught fish on Picasso spinner baits, chatter baits and Tight-Line swim jigs rigged with Missile Bait swim baits. Most of the week was spent looking for bait, surfacing and scattered grass in areas of the lake facing main points and channels.